Content by Tony Macklin. Originally published on February 4, 2013 @ tonymacklin.net. "Let's go see a movie based on the compelling fiction of a French writer." "No, Bullet to the Head." "It's much shorter, and has more beheadings." Bullet to the Head is based on a 3-book graphic comic series written by Matz (Alexis Nolent) and drawn by Colin Wilson. In 2004 Du plomb dans la tete (Lead in the Head) won the Prix Saint-Michel comics award for Best Story. Later an English translation was published titled Bullet to the Head. Wilson says that he and Matz preferred the title Headshot, which was the original title of the film. Bullet to the Head is an odd-couple buddy movie. Bent hitman Jimmy "Bono" Bonomo (Sylvester Stallone), after his partner (Jon Seda) is murdered joins up with a straight arrow Korean-American detective Taylor Kwon (Sung Kang), who has come from Washington, DC, to track down the killer of his former-partner. Age, culture, and ethics drastically separate the two, but they share a goal to find the killers, despite their severe disagreement about what to do with them. You can probably guess what the Stallone character wants to do. Their quest puts them up against a corrupt land developer (Adewale Akinnuoye-Agbale) and his killing machine (Jason Momoa). Bono's daughter Lisa (Sarah Shahi) adds to the trouble. The plot is connect-the-bloody-dots. It's fundamental Stallone. I first saw Sly at a press conference for Rocky in LA. His wife Sasha acted as his personal photographer snapping a bevy of pics of her beloved. Even then Sly's granite ego was impressive. 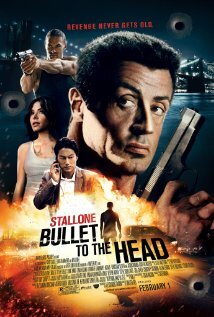 One thing that Stallone has learned throughout his rocky career pays off in Bullet to the Head. He knows the director matters. John G. Avildsen won the Oscar for directing Rocky, which also won for Best Picture. Stallone wanted to direct, but wasn't allowed to. But Stallone did direct Rocky 2, 3, 4, and 6. Avildsen returned for Rocky 5. In Bullet to the Head Stallone is fortunate to have a veteran director to put him through his rigorous paces. Walter Hill stays pretty much out of Stallone's way, but he brings some style to the frenetic antics. Walter Hill hasn't directed a film in ten years, but he's still proficient. Hill (48 Hrs., 1982 and Last Man Standing, 1996) is back in New Orleans for the third time. He shot both Hard Times (1975) and Johnny Handsome (1989) in the Big Easy. He also did Southern Comfort (1981) in the bayou. He now has the Big Easy (Stallone) in The Big Easy (New Orleans). Hill offered to make the movie in digital, but was told producers wanted it on film. It is another disappearing old school value. Perhaps they wanted the gore to have better texture. Hill knows what he is doing. He has a serviceable screenplay by Alessandro Camon from the French series. Hill keeps the action revved up. Quips and rips. Hill relies on flurries of violent, brutal action. He knows the value of sound, and the music pounds and throbs, and has a Cajun twang. The action is accompanied by a cacophony of noise: clangs, explosions, whirrs, and crashes. Stallone is stolid, but still has some gravitas. He delivers amusing wisecracks with his patented mumbling lilt. He looks like Mr. Freeze. No, that's Arnie down the hall in the cineplex. Stallone is an old lion, although now a bit mangy, but still has his instincts. Sung Kang is a suitable subject for the wisecracks. But his character is even more inviolate than Stallone's. Taylor is shot and stitched up and in great pain. After the stitching, he has absolutely no aftereffects, and is as athletic and energetic as though nothing happened. It's that kind of film. Sarah Shahi (tv's Fairly Legal) is affecting as Bono's daughter Lisa. And Momoa (HBO's Game of Thrones) makes a hulking villain. Bullet to the Head is one of those films that depend on what you bring to them. Bring popcorn, because it's a popcorn movie. It's caricature-driven. Which, in the case of Sly Stallone, is not necessarily bad. Bullet to the Head is a blunt movie with a blunt star.